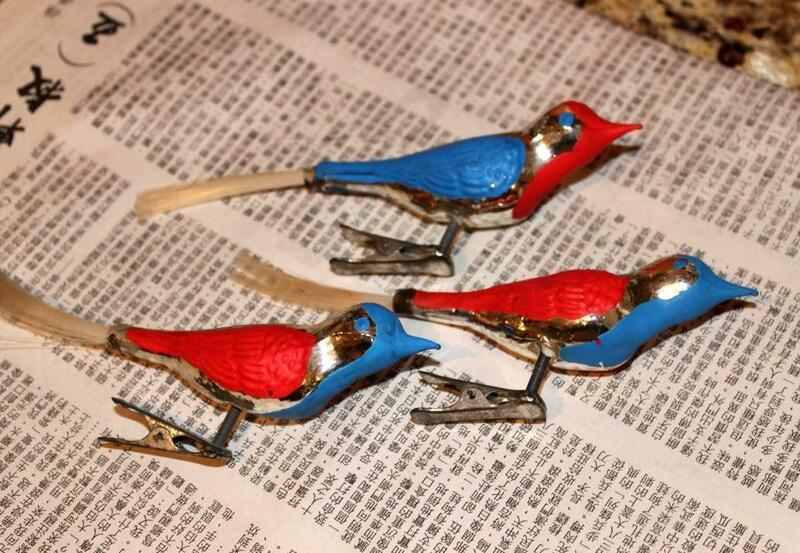 So, a few months ago in a junk shop I found a small flock of 6 of these clip-on mercury birds with spun glass tails. I was smitten instantly, they all still had their tails and a clip on a spring….but just couldn’t put my finger on what was missing with them…. Once I mixed them in with the thousands of ornaments I already have …it hit me. The matte paint was a little lacking . They didn’t have any “sparkle”. No worries…..that is a quick fix. Lucky for me, and the rest of humanity, Martha makes a line of superfine glitter….AND, wait for it, clear craft glue with a superfine tip. Now I can “draw” the glue on the wings and head. I didn’t want them to look too new…so I tried to only accent the original red and blue paints with coordinating glitter ( Garnet and Lapis ) ….and not completely hide them . Last year after Christmas we picked up a several boxes of bead garland at Restoration Hardware, by far one of my favorite stores, but pretty far from my everyday shopping price range ( that would be Target ) . So trust me , I think they were about 75% off of retail. I love the perfectly aged look they have , but each string has only one color and one shape. Pretty Boring. Since we got several sizes and shapes…and a couple different colors……we decided to restring them in mixed patterns. So we cut them up, one bowl per bead, and restrung them on 28 gauge wire ….into 6 foot strands. This couldn’t be any easier………..